Wolfgang Deep Gloss Paint Sealant 3.0 will alter your perceptions of paint sealants forever. The glossy, liquid-like shimmer enhances all types and colors of paint. No other synthetic wax or paint sealant gives your vehicle the gloss, the depth, and the protection of Wolfgang Deep Gloss Paint Sealant 3.0. Now with fortified polymer technology, Wolfgang Deep Gloss Paint Sealant 3.0 is simply the best paint sealant you’ll ever use. The entire Wolfgang Concours Series collection is built around this single product. 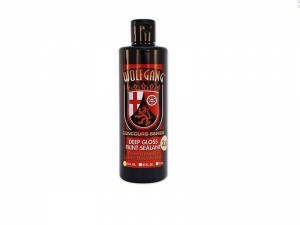 Wolfgang Deep Gloss Paint Sealant 3.0 was developed in order to meet the demand for a paint protectant that captures the wet look of a carnauba wax but lasts longer. Immediately, we looked to the newest breed of crystalline “super” polymers being developed in Germany. German Super Polymers were the foundation of our original groundbreaking formula.